KATHMANDU, Oct 10: Chief Executive Officer (CEO) of the National Reconstruction Authority (NRA) Sushil Gyewali on Tuesday said that the authority is all set to send a senior engineer each to the quake-affected local units to support the reconstruction work at the local level. At a meeting held at the NRA office on Tuesday with the representatives of the Municipal Association of Nepal (MuAN) and National Association of Rural Municipality in Nepal (NARMN), the umbrella organizations of the local bodies, CEO Gyawali said that the senior engineers will be sent to the local levels to make it possible for the local levels to pass the inspection forms that were previously passed by the district. CEO Gyawali added that the local levels have been vested with more responsibilities so as to make the reconstruction process more convenient. “We have now handed the local bodies the responsibility to certify the complaints of the 2015 quake victims who have applied for the private housing reconstruction grant,” he said. He added that the authority has expected various forms of support from the local bodies. “We expect the local bodies to assist us in the formation of the local reconstruction coordination committee, take forward the works of the reconstruction of unified settlements and inspect the situation of the applicants of the private housing reconstruction grant who are in risky areas,” he said. In the meeting, the representatives of MuAN and NARMN reassured the authority that the local levels are ready to assist the authority in the reconstruction process. They told the authority that they have prioritized reconstruction and are willing to coordinate with the authority to expedite the reconstruction works. President of MuAN and Mayor of Dhulikhel Municipality Ashok Kumar Byanju Shrestha claimed that the process of distribution of the installment of the private housing grant is proving to be a lengthy one and advised the authority to hand the local levels the responsibility to distribute the installments. He said that the local levels should also be handed the responsibility to appoint technicians for reconstruction in addition to the rights handed to them to mobilize the technicians. “If we were handed the right to do so, the reconstruction process would be much faster,” he said. He also requested the authority to provide socio-technical services to the local levels. 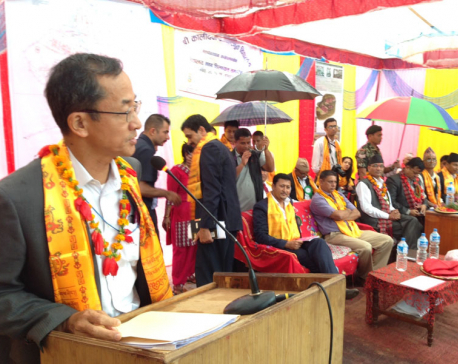 President of NARMN and chairperson of Jugal Rural Municipality, Hem Narayan Shrestha, said that one of the difficulties that the reconstruction process is facing is the lack of manpower. “Groups such as the ‘Tole’ improvement committees should be transformed into the community committees that the authority has decided to form,” he suggested. Welcoming the decision of the authority to provide concessional loans to the earthquake victims, Shrestha said that the authority should also have provisions to make the loans available to the beneficiaries of the private housing grant who have already received one or more installment of the grant.